The steam locomotive no. 750 has been restored and can be seen at the Roundhouse Railroad Museum in Savannah, GA. Controlled by the Central of Georgia, then the Southern RR and now part of the Norfolk Southern System. Mouse pad honoring the new Savannah & Atlanta Heritage diesel operated by the Norfolk Southern Railroad. Savannah & Atlanta diesel joins Norfolk Southern Railroads Historic diesel fleet. 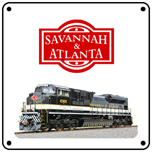 6 inch x 6 inch square tin sign of the historic Savannah & Atlanta Heritage diesel. A powerful locomotive paint scheme. 6 inch x 6 inch square tin logo sign of the Savannah & Atlanta Railroad, now part of the Norfolk Southern Railroad family.